The FAA has streamlined the process for approving and installing aftermarket AOA units in general aviation (GA) aircraft in an effort to combat loss-of-control (LOC) accidents. The hope is that the additional information will alert pilots of a low airspeed condition before an aerodynamic stall occurs, especially during takeoff and landing. If you don’t have AOA (or any stall warning for that matter) it doesn’t necessarily mean you are at an increased risk of falling out of the sky due to LOC. 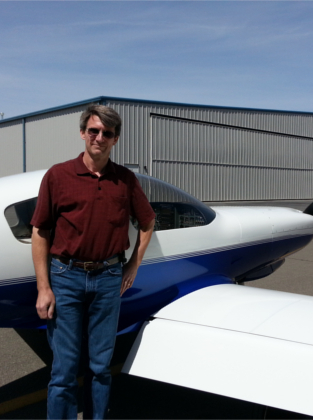 When I started flying my Lancair some 20 years ago it had no stall warning system, so I developed guidelines based on aerodynamic principles to keep me safely away from inadvertent stall while still allowing for precision landings. I see LOC in the pattern rooted in three areas: First is the pilot’s failure to prioritize monitoring and controlling airspeed. Second is the pilot’s failure to understand the proper use of minimum airspeeds for a particular phase of flight. And third is the pilot’s failure to treat airspeed targets as hard lower limits. Once slowed to pattern speed, the pilot must check airspeed every few seconds, regardless of what else is going on. The slower you are, the more frequent the check. It just takes a quick glance at the airspeed indicator—a few hundredths of a second—to see if the needle has moved. Pilots must prioritize airspeed as the most critical of all items to monitor in the pattern; everything else is secondary. After all, if you run out of airspeed, nothing else matters. Prioritizing the airspeed doesn’t mean you fixate on it, it simply means you check it frequently enough so that it never has enough time to wander off target speed, especially below target speed. Other tasks requiring attention; looking for traffic or ground references, re-configuring the aircraft, tuning radios etc. are sub-divided to fit in between airspeed scans. What minimum airspeed is appropriate? Here it is critical to make a distinction between maneuvering in the pattern and flying final approach, where you are aligned with the runway. Pilots should never use final approach speed if still maneuvering from downwind to base to final. The typical final approach speed is 1.3 x VSO. The stall margin at this speed is quickly eroded in turns due to the increased load factor. There are some very simple rules of thumb that will keep you out of trouble during that base-to-final turn. We are all taught that level turns increase stall speed. Not many, however, can tell you off the top of their head how much stall speed increases in a turn. Here, we can simplify things so that you really only need to remember one number. Most turns in the pattern are at relatively shallow bank angles, typically much less than 60 degrees. A 60-degree-bank level turn generates a load factor of 2 Gs. Maintaining 2 Gs requires 1.41 x VSO. Let’s round up to 1.5 x VSO to simplify the math. At 1.5 x VSO one can maintain 2.25 Gs. If your stall speed is 60 KIAS, then 90 KIAS provides 2.25 Gs capability. So, flying 1.5 x VSO in the base to final turn will guarantee a fat margin toward stall avoidance. The difference between 1.3 x and 1.5 x VSO is small, around 10 knots, but it makes a big difference in available load factor. Just as higher speed adds to load carrying capability, lower speed quickly erodes it. Therefore, it cannot be stressed enough that predetermined target speeds should be treated as hard lower limits. Example: Known stall speed of 58 KIAS at 1700 lb. What is stall speed at 1900 lb? If you know the stall speed at any given weight you can determine stall speed for any other weight. Pilots of transport category aircraft (or their flight management systems) determine approach speeds for every landing based on similar principles. Because the range in weight of a typical light plane, especially two-seaters—is small, the spread in stall speed is also relatively small. If your flight testing was at less than gross weight, you can determine stall speed at gross weight using the above equation. Know the appropriate speeds to fly. Make airspeed control your number one priority. Treat target airspeeds as hard lower limits. For questions/comments on this post contact Chris via email at chris_zavatson [at] yahoo.com. For more information visit www.n91cz.net.